Swansea is a town in Bristol County in southeastern Massachusetts. It is located at the mouth of the Taunton River, just west of Fall River, 47 miles (76 km) south of Boston, and 12 miles (19 km) southeast of Providence, Rhode Island. The population was 15,865 at the 2010 census. The villages of Hortonville, Barneyville and Ocean Grove are located in the town. Swansea was named for the Welsh city of Swansea, which had been the hometown of some original settlers. John Miles, the founder of the first Baptist Church in Wales, moved to Swansea in 1662/3. William Brenton had purchased the land from Native Americans. Parts of its territory were originally part of Rehoboth, Massachusetts. In 1667 the first Baptist church in Massachusetts relocated to Swansea from Rehoboth after experiencing religious intolerance there, and Swansea was incorporated as an independent town. Initially, the town established a committee to assign rank of 1, 2, or 3 to the residents with the first getting 3 acres of land, the second 2, and the third 1. The committee could promote and demote residents as it saw fit. The system collapsed in 1681 when the committee voted to make five residents the highest rank and to make the rank hereditary. The town unanimously voted to abolish the system. On June 20, 1675, the first Indian attack of King Philip's War had all 70 settlers confined to their stockade. The attack had taken place at the Miles Garrison, near the Coles River. By June 25 the entire town had been burned, although a handful of the colonists escaped to Taunton. When the active war ended in 1676, the town was soon rebuilt. The Miles (or Myles) Garrison stood the test of time, but was demolished in the 1970s. The plot it was on remains overgrown, free from construction, and a commemorative marker was placed there by the Commonwealth of Massachusetts in 1912. After the war, many small industries, such as forges, ironworks and fisheries, opened up in the town. Many would later leave, and there remains a large agricultural sector. What is now Barrington, Rhode Island (part of Massachusetts until 1747) was separated from the rest of Swansea in 1717, over religious differences. In the late 1890s, trolleys connected the town to Providence, Fall River and Taunton, and the town has retained a suburban residential feel. Today Swansea is well known for its retail areas. Swansea gained national attention in 1985 when Mark Hoyle, a young hemophiliac who had contracted AIDS through a blood transfusion, was allowed to attend public schools by Jack McCarthy, Superintendent of Schools. It was the first time in the U.S. that a student known to have the disease was allowed to enter public schools. The case came to national attention around the same time as that of Ryan White in Indiana, and helped many children with HIV attend schools throughout the country. Hoyle died one year later, and a new elementary school was named in his honor. The town has a total area of 25.5 square miles (66 km2), of which 23.1 square miles (60 km2) is land and 2.5 square miles (6.5 km2), or 9.67%, is water. The town is bordered by Dighton on the northeast, Somerset on the east, Mount Hope Bay on the south, Warren, Rhode Island, on the southwest, Barrington, Rhode Island, on the west, and Seekonk and Rehoboth to the north. Part of the town's border with Somerset is made up of the Lees River. The Cole, Kickamuit and Palmer rivers also pass through the town on their way south to Mount Hope Bay (for the Kickamuit, Cole and Lees rivers) and Narragansett Bay (for the Palmer). The entire town is a part of the Narragansett Bay watershed area. The town's neighborhoods include Barneyville, North Swansea, Swansea Village, Birch Swamp Corner, Hortonville, Luther Corner, South Swansea, Touissett, Ocean Grove, and Smokerise. Swansea is 12 miles (19 km) southeast of Providence and 47 miles (76 km) south of Boston. Much of the town's retail businesses are located along the highways, with the area around the junction of U.S. Route 6 and Massachusetts Route 118 where the formal Swansea Mall was located. Just north of the mall are several office complexes, including the former headquarters of the First Federal Bank (now a division headquarters for Webster Bank, which bought it out), doctor's offices and Academic Management Services, a division of Sallie Mae. The area along Route 103 between the Lees River and the Cole River is also an area for retail, with many smaller businesses lining the road. However, outside of the retail area (as well as the densely populated neighborhoods of Ocean Grove, South Swansea and Smokerise), much of the area is rural. As of the census of 2000, there were 15,901 people, 5,888 households, and 4,539 families residing in the town. The population density was 689.4 people per square mile (266.2/km²). There were 6,070 housing units at an average density of 263.2 per square mile (101.6/km²). The racial makeup of the town was 97.91% White, 0.38% African American, 0.08% Native American, 0.36% Asian, 0.01% Pacific Islander, 0.27% from other races, and 1.00% from two or more races. Hispanic or Latino of any race were 0.60% of the population. There were 5,888 households out of which 31.1% had children under the age of 18 living with them, 64.6% were married couples living together, 8.8% had a female householder with no husband present, and 22.9% were non-families. 19.6% of all households were made up of individuals and 10.2% had someone living alone who was 65 years of age or older. The average household size was 2.67 and the average family size was 3.06. In the town, the population was spread out with 22.2% under the age of 18, 6.7% from 18 to 24, 28.4% from 25 to 44, 27.0% from 45 to 64, and 15.7% who were 65 years of age or older. The median age was 40 years. For every 100 females, there were 96.9 males. For every 100 females age 18 and over, there were 92.3 males. The median income for a household in the town was $52,524, and the median income for a family was $60,567. Males had a median income of $40,056 versus $27,072 for females. The per capita income for the town was $21,776. About 3.4% of families and 4.9% of the population were below the poverty line, including 2.9% of those under age 18 and 11.0% of those age 65 or over. On the state level, Swansea is a part of two state representative districts, the Fourth Bristol (including Rehoboth, Seekonk and part of Norton, Rep. Steve Howitt) and Fifth Bristol (including Dighton, Somerset and part of the city of Taunton, Rep. Patricia Haddad). The town is part of the First Bristol and Plymouth state senatorial district, which includes the communities of Fall River, Freetown, Lakeville, Rochester, Somerset and Westport, currently Senator Michael Rodrigues (D-Westport) represents Swansea. Swansea is patrolled by Troop D (Southeast District), 3rd (Dartmouth) Barracks of the Massachusetts State Police. On the national level, the town is part of Massachusetts's 4th congressional district, which is represented by Joseph Kennedy III. The state's senior Senator is Elizabeth Warren and the state's junior Senator is Edward Markey. The town is governed by Selectmen and an Administrator. Swansea also maintains the tradition of open Town Meetings. As of 2001, total property values are assessed at $980 million, and property taxes amount to $15 million. The town operates on a budget of approximately $10 million, which does not include another $13.5 million spent on schools. The town has four fire stations (the Central station being in South Swansea, with branch stations in North Swansea, Central Swansea and Ocean Grove), one library, a single police station, and a new post office. The town has two playgrounds, as well as a town beach with a picnic area (near the mouth of the Cole), and the town conservation farm. Swansea School Administration building, Main Street and Hortonville Road. The Swansea Public Schools serve the town, with four elementary schools (Joseph G. Luther Elementary School at Luther's Corner, Gardner Elementary School in the South Swansea-Ocean Grove neighborhood, Elizabeth S. Brown Elementary School near the town center, and Mark Hoyle Elementary School in North Swansea), as well as Joseph Case Junior High School and Joseph Case High School, both located in the town center. Case High School (as it is commonly known) has the school colors of maroon and gold, and its mascot is the Cardinal. 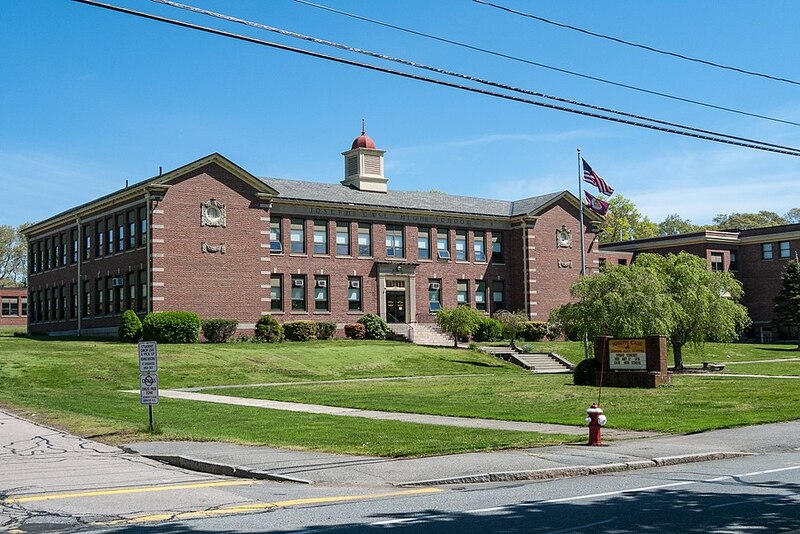 High school students also have the option of attending Diman Regional Vocational Technical High School in Fall River, or Bristol County Agricultural High School in Dighton. There are two Christian schools in town, and there are also local Catholic schools in nearby Warren and Fall River. Eastern Nazarene College offers Adult Studies/LEAD classes in Swansea. The town is bisected by Interstate 195, U.S. Route 6, and state routes 103, 118 and 136. Swansea has two exits off I-195 serving the town, Exit 2 (Route 136) and 3 (Route 6 to Route 118). In addition, Exit 4 (Route 103) in Somerset provides quick access to the Ocean Grove neighborhood. Swansea is the western terminus of the Southeastern Regional Transit Authority (SRTA) bus line. Regional bus service can be reached in Fall River, and the nearest regional rail service is in Providence. The nearest national airline service can be reached at T. F. Green Airport in Rhode Island, and international service can be reached at Logan International Airport in Boston. ^ "Profile of General Population and Housing Characteristics: 2010 Demographic Profile Data (DP-1): Swansea town, Massachusetts". U.S. Census Bureau, American Factfinder. Retrieved December 6, 2011. ^ a b c Wright, Otis Olney, ed. (1917). History of Swansea, Massachusetts, 1667-1917. Town of Swansea. pp. 3–4. OCLC 1018149266. Retrieved 10 June 2018. ^ "Myles Garrison House Site Historical Marker". Retrieved 2018-01-25. ^ "Schools poised to adopt official policy on HIV", Providence Journal, 14 Jan 2004. ^ "BROWN, Benjamin, (1756 - 1831)". Biographical Directory of the United States Congress. Retrieved September 29, 2012. ^ "Oliver Chace". Find A Grave. Retrieved September 29, 2012. Benjamin Brown (September 23, 1756 – September 17, 1831) was a physician and an American politician who served in the United States Congress as a United States Representative from Massachusetts (Maine was a part of Massachusetts until 1820). Benjamin Carpenter (May 17, 1725—March 29, 1804) was a leader of colonial Vermont who served as an officer in the American Revolution and as Lieutenant Governor. The Benjamin Cole House is a historic house at 412 Old Warren Road in Swansea, Massachusetts, United States. Built in 1609, this house is the oldest documented building in Swansea. Robert Evans (born September 3, 1972) is an American professional wrestler and trainer, best known for his work in Ring of Honor (ROH). He also wrestles for various independent circuits. The David M. Anthony House is a historic house at 98 Bay Point Avenue on Gardner's Neck in Swansea, Massachusetts. Built in 1895 for a prominent Fall River businessman, it was one of the first summer houses in the area, and is a high quality example of Queen Anne Victorian architecture. It was listed on the National Register of Historic Places in 1990. The First Baptist Church and Society is an historic Baptist church on Baptist Street in Swansea, Massachusetts. The congregation, founded in 1663, is the oldest Baptist congregation in Massachusetts and one of the oldest in the United States. The congregation was founded in 1663 by John Myles as the first Baptist congregation in Massachusetts, and Myles brought the Ilston Book with him from Swansea in Wales. The congregation in Swansea, Massachusetts was located relatively nearby the First Baptist Church in America in Providence. The current Greek Revival meeting house was constructed in 1848 and is the fifth building occupied by the congregation. The adjacent cemetery dates to 1731. The building and cemetery were added to the National Register of Historic Places in 1990. The Hooper House is a historic house located at 306 Hortonville Road in Swansea, Massachusetts. Hortonville is a village in the town of Swansea, Bristol County, Massachusetts, United States. The part of the village on Locust Street from Oak Street to Hortonville Rd. makes up the Hortonville Historic District, which was listed on the National Register of Historic Places in 1990. Joseph Case High School is a 4 year public high school located in Swansea, Massachusetts. It hosts grades 9-12 and has a student population of just above 500. Case High School is most known in the area for its theatre program (www.CaseHighTheatre.com), which includes participation in the METG Drama Festival with 28 state entries and 6 wins (1982, 1993, 2004, 2007, 2014, 2017). It is also very well known for its Volleyball team as they have won multiple state championships in the Massachusetts Interscholastic Athletic Association. Luther's Corner is a historic district encompassing the original economic center of Swansea, Massachusetts. The district is centered on the junction of Old Warren and Pearse Roads, the former being a major stage route between Fall River and Providence, Rhode Island, and was for many years associated with the locally prominent Luther Family. Luther's Corner was added to the National Register of Historic Places in 1990. The Norton House is a historic house located at 61 Old Providence Road in northern Swansea, Massachusetts. Ocean Grove is a census-designated place (CDP) in the town of Swansea in Bristol County, Massachusetts, United States on the north shore of Mount Hope Bay near the Cole River. The population was 2,811 at the 2010 census. Oliver Chace (August 24, 1769 – May 21, 1852) was an American 18th & 19th century entrepreneur. He was the founder of several New England textile manufacturing companies in the early 19th century, including the Valley Falls Company, the original antecedent of Berkshire Hathaway, which as of today is one of the largest and most valuable companies in the world. The Simcock House is a historic house at 1074 Sharps Lot Road in Swansea, Massachusetts. Construction of this 2-1/2 story vernacular Georgian house is estimated to have been around 1765; little is known of its history before the 19th century. It is architecturally unusual, with three asymmetrically placed bays and a large central chimney. The door is in the center bay, with a window above that is slightly narrower than the flanking windows.The house was listed on the National Register of Historic Places in 1990. The South Coast of Massachusetts (sometimes stylized Southcoast) is the region of southeastern Massachusetts consisting of southern Bristol and Plymouth counties bordering Buzzards Bay, and includes the cities of Fall River, New Bedford, the southeastern tip of East Taunton and nearby towns. The term is recent, dating to the 1990s, and sometimes confused with the South Shore (a region southeast of Boston that includes Norfolk, Northern Bristol and eastern Plymouth counties). South Swansea Baptist Church (formerly South Swansea Union Church) is a historic church building at 25 Church Street (corner of Gardner's Neck Road) in Swansea, Massachusetts. Built in 1916, it is Swansea's best example of a Shingle-style church. The church was listed on the National Register of Historic Places in 1990. Thomas Willett (1605 – August 29, 1674) was a British merchant, Plymouth Colony trader and sea-captain, Commissioner of New Netherland, magistrate of Plymouth Colony, Captain of the Plymouth Colony militia and was the 1st and 3rd Mayor of New York City, prior to the consolidation of the five boroughs into the City of New York in 1898. Warren Albert Cole (15 November 1889 – 29 December 1968), born in Swansea, Massachusetts, was a businessman and lawyer and is known as the founder of Lambda Chi Alpha Fraternity. The William P. Mason House is a historic house located at 5 Mason Street in Swansea, Massachusetts.